FullHD-video-decoding and displaying in general works like charm. 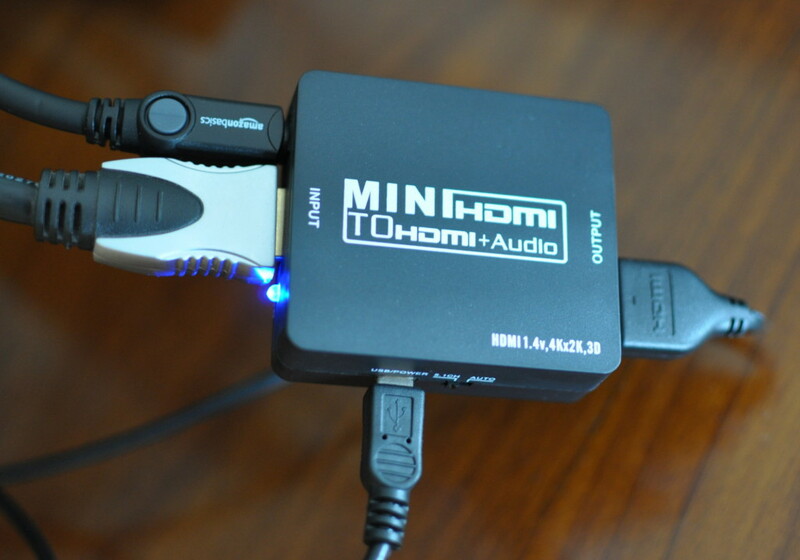 and forwards the original HDMI-signal on a HDMI-output. 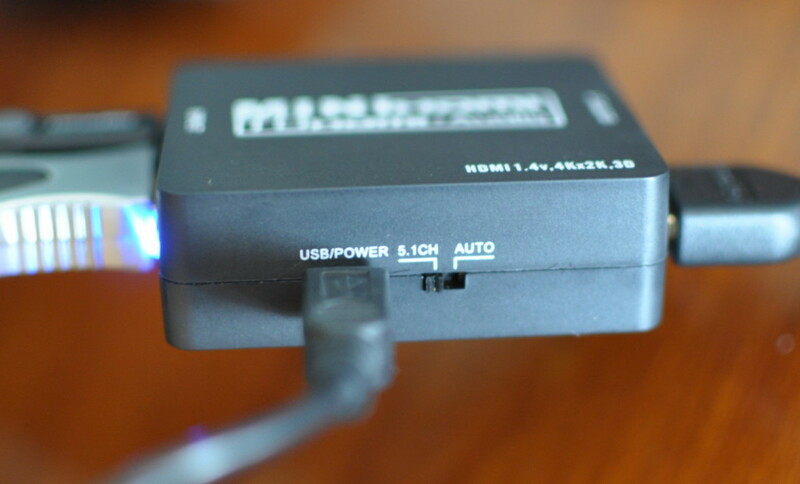 Ideally this device is small and powered over USB (so that it doesn’t need an extra power-supply). It took me some time but I eventually found one on Amazon for around 25 euros. Other people have seen this kind of devices on eBay in 2014 and earlier. Problem 1: even when playing AC3-audio (2.0, 2.1 or 5.1), the Pi would only send PCM-frames. Problem 2: after a cold-start, the Pi was not able to determine the correct resolution of my screen. When connecting a HDMI source to a HDMI sink (or when powering up one of them), the source gets some meta/configuration-information about the sink. It reads the so-called EDID-data. In it, among others, the source can find the supported screen-resolutions and the supported audio(-container)-formats. Based on the list of accepted audio-formats the Raspi, or better the OpenMax-library (omx), will determine whether or not to pass-through AC3-audio (integrate it into the HDMI-data-stream). At some point in time that EDID data is read and if it does not list the capability, the software won’t even try to send AC3-data, but will decode it in software to Stereo-PCM. But wait, now that there is the HDMI-splitter, where is the EDID-data coming from? Well, the splitter just passes through the information from my screen to the Raspi. My screen does not have a digital audio output. Most likely it tells sources that is doesn’t support anything other the PCM-audio. And there is edidparser for decoding the dumped .dat-file. This last snippet shows the parsed the EDID-data. It was as I was suspecting. Nothing else then PCM is accepted by my HDMI-sink. There seems to be several ways to convince the system that AC3-passthrough is possible though. The easiest for me was to use the switch provided for this reason on the HDMI-splitter. By default it is set to auto which gives the EDID seen above. By default the Raspi will select the native resolution of a screen as per EDID-data. My splitter is powered by the Raspi, so it is not running before the Raspi boots. It seems that at the moment the Raspi reads the EDID-information the splitter has not yet read the EDID from the screen. I don’t know what kind of data is received this way, but it is not correct. Now everything worked as I wanted it to be.